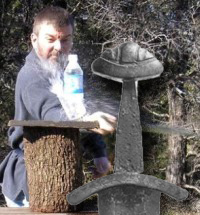 Viking Swords have a reputation for being brutal, heavy, and unwieldy. 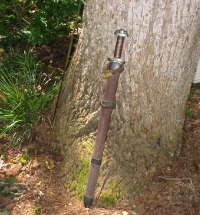 These swords and misconceptions about them are made popular by films like The Thirteenth Warrior, in which the main character (played by Antonio Bandaras) can barely lift one, let alone fight with it. Most experts agree that Viking Swords as they are commonly recognized grew out of interactions between the Roman Empire and Germanic Cultures that made their way North. The earliest finds of were single-edged, like the Scramasax, a short, single-edged blade common across Europe but especially with Viking and Germanic cultures (pictured below, though historically they were not generally found stuck through a plastic target). 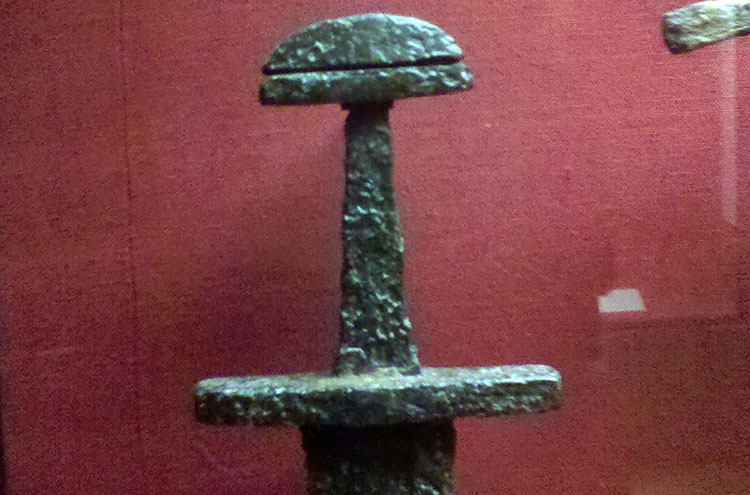 While Viking Swords may appear to be the same across the board, Petersen identified 26 different types in common use from the 8th century and onward. 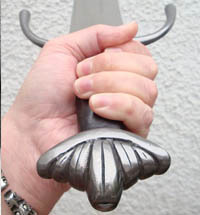 These were mainly defined by their hilt and pommel variations, as the blade types were quite similar - averaging 94 cm in length, deep, wide fullers, and yet almost exclusively one-handed (Vikings tended to fight with a sword in one hand and an axe, buckler or other weapon in the other hand). The blades also began showing signs of early distal tapers, which led to them being quite well-balanced and comparatively light to later Medieval Two-Handed Swords. In 1927, R. Wheeler distilled Petersen's 26 types down to 9, from I to IX, which paved the way for the Oakeshott Typology system for Medieval Swords. 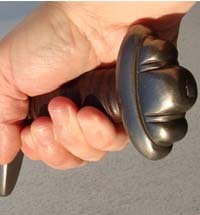 The differences from type I-IX can be difficult to spot, as the characteristics that make the Viking Sword so unique (smaller hilt, the decorative pommel beneath a single-handed grip) have many variations. In our price range there are a large number of available products. 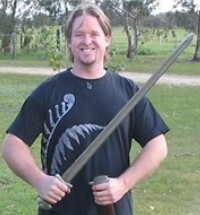 Virtually every budget sword maker has tried their hand at a Viking design, with varying degrees of success. However, from SBG's favorite forges come some highly attractive, well-priced and well-made pieces that would have made any Viking warrior welcome in the Halls of Valhalla. 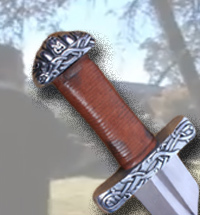 Perhaps the most historically accurate of all replica Viking swords under the $300 price point is the River Witham sword reviewed below. 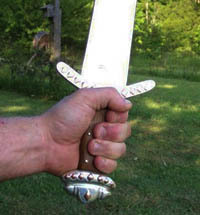 Windlass has produced several Viking swords over the years. Unfortunately, few of them remain around long enough to gain much popularity, as Windlass tends to rotate their production stock fairly frequently. 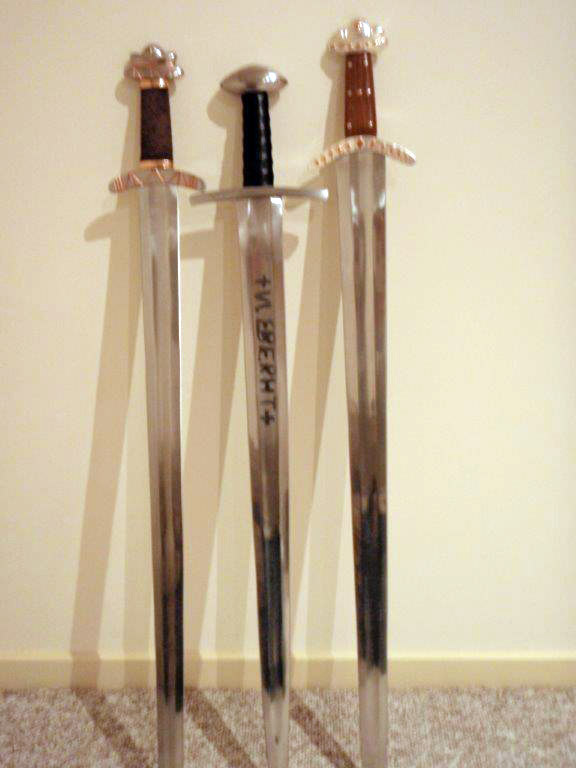 Click the image to see a quick side by side comparison of the Sticklestad, Leuterit & Ulberht Viking Swords by Windlass steelcrafts - swords that have been in continuous production for well over a decade now - and that says something..
To quote the author:"To be honest I expected them to feel like three identical swords with different cosmetics, I couldn't have been more wrong." 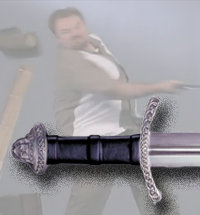 Windlass Dark Age Sword: Reviewed by popular YouTube celebrity Skallagrim before he was known as Skallagrim - this sword had a lot of potential, but ended up a mess and will not be particularly missed. Windlass Beowulf Sword: A lot of people were looking forward to this fairly decent historical replica of a migration era sword. That was before they found out Windlass took a nasty shortcut and used a bit of break apart plastic for one of the decorative pommel rings that is.. Cold steel tend to take a shotgun approach to their functional sword range - covering as many eras and cultures as possible with at least one sword marketed for its cutting power and durability. Their offering to the world of Viking swords is no exception - but for this one, historical accuracy takes a back seat. Hanwei have almost bowed out of the Viking sword market, but they still have at least a couple of swords that has been doing the rounds..
Darksword Armory have actually had quite a decent range of super tough, beater Viking swords over the years. Not all of them have been reviewed here, but from what has you should get a pretty good idea of what to expect from their offerings. 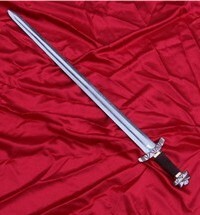 Darksword Armory Saxon Sword: The Saxon by Darksword Armory was a simple design, but despite it's simplicity was actually quite attractive and authentic. But as with all DSA swords, it had a reputation for extreme durability - and in this review it was certainly put through its paces (and then some). Del Tin is an Italian sword making company with a long reputation for making quite historically accurate ancient and medieval European swords. Their range of Viking swords are no exception.. The site includes diagrams, historical information, and photographs of actual recovered relics from Viking Times. The language can be a bit academic at times and the translation is no where near complete, but it is a good introduction to the genre. 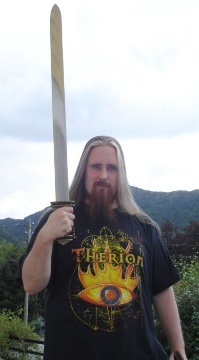 As always, the various sword forums are a good place to learn more about any type of sword. 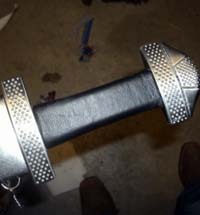 I hope this information on replica Viking Swords has been helpful. 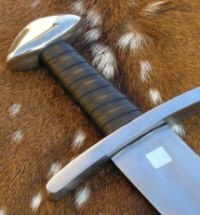 To return to the Sword Buyers Guides Homepage from Modern Replicas of Viking Swords, click here.